We provide a reliable and professional around the clock breakdown recovery service, all over the North West area. We offer competitive prices whatever the size of your vehicle and getting you home safely and quickly is our priority! Our first truck is a Mercedes-Benz Atego shown in the picture, this is our bigger truck which is a 7.5-tonne tilt and slide. This recovery vehicle is equipped to carry two cars or vans at once as it is fitted with an extendable spec lift. It also has a Massey tow bar attached so that we can recover you and your vehicle, including any trailer or caravan you could be towing. Our second truck is a Mercedes-Benz 3.5 tonne recovery truck for smaller cars and vans. This is for much smaller cars and vans due to weight restrictions. 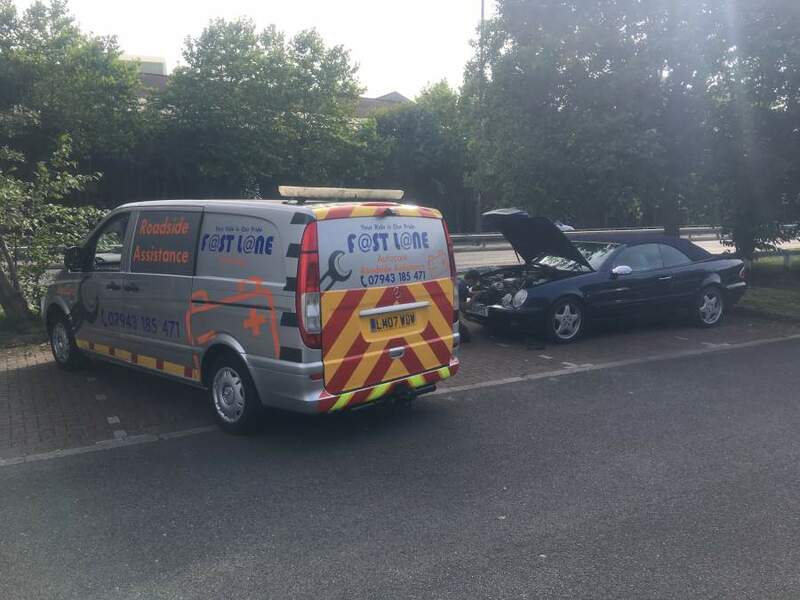 We provide a fast and efficient call out service for any type of breakdown or accident recovery. With Fastlane Autocare, there is no 'joining up' cost or membership fees. We are simply here to help when you need us the most; a reliable recovery service available 24 hours a day, 7 days a week. 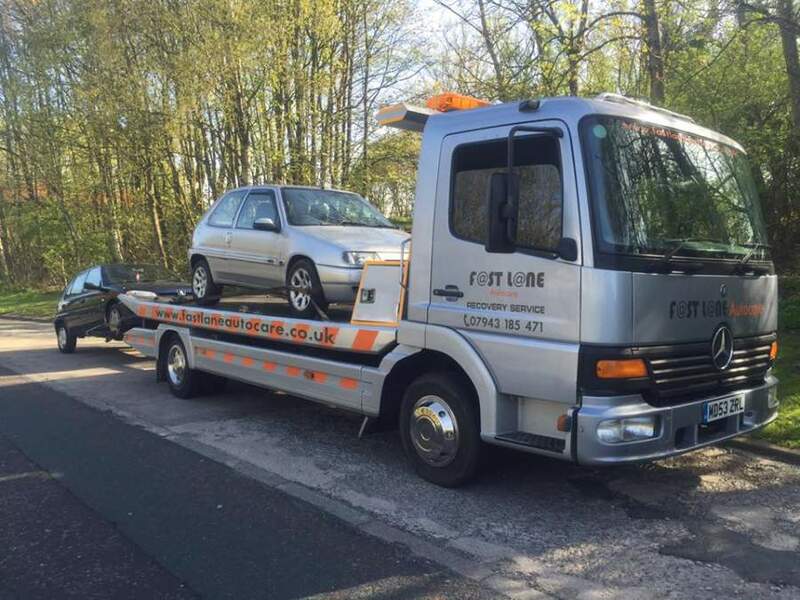 Our trained recovery team will get you and your vehicle/s home as quickly and efficiently as we possibly can. It is always our aim to get to you within the hour. If this is not possible, we will always keep you updated with our live truck tracking system that will provide you with a countdown to our arrival. Our recovery vehicle is specially designed and built to cater for cars that are very low to the ground like Ferrari or American vehicles such as Astro vans and even TVR Tusken. These vehicles pose no problems for our recovery team, due to the very small loading angle of the recovery platform ensuring no damage is caused to the low spoilers and bumper spoilers. If you have broken down, had a crash or just need a vehicle transporting, give us a call on 07943185471. All of our drivers are trained, uniformed and CPC tested. We also have a 24/7 tyre fitting van that can save you money and time if you have a blowout or puncture by dealing with the cause of your vehicle's problem there and then at the roadside. We offer roadside assistance, mobile tyre assistance and recovery all over the North West area, 24 hours a day 7 days a week, so regardless of your vehicles issues whether it be a flat tyre, engine failure or even a flat battery, we are on hand and ready to help! We have branches all over the North West area of England. Each of our branches is equipped to deal with any roadside assistance or emergency roadside recovery and tyre fitting you may need. We have branches in many areas including: Stockport, Congleton, Trafford, Manchester, Wigan, Middleton, Preston, Leyland, Blackpool, Liverpool, Southport, Runcorn, Atherton, Wirral, Chester, Lymm, Cheshire, Radcliffe, Helsby, Leyland, Oldham, Queensferry, Skelmersdale, Swinton, Trafford, Walkden, Deeside, Denton, Hale, Chorley, Bury, Bolton, Warrington and Widnes. In fact, any location in the North West that you need our assistance, we are here to help. For immediate response, call us now on 07943185471. A trained member of the Fastlane Autocare team will be ready to take your call and get you moving again!